For many in the Mid-Atlantic region, Charm City Cyclocross, which takes place September 20, is the kickoff to the CX season. It’s our Daytona 500. The big race right at the beginning of the season. And although it seems like this has been the case forever, the race is not that old. 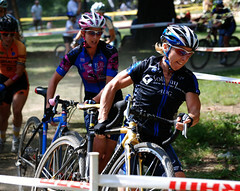 Born out of weekly ‘cross practices, the event has grown from a small grassroots effort in 2005, into a UCI-sanctioned event boasting fields of over 100 racers in several categories. If you haven’t registered yet, you may be out of luck as many of the races are full. But just in case, check here to make sure. At last glance, a couple precious spots in a few categories remained. To get the scoop on what it takes to pull off this event, we talked to one of the race promoters, and a member of Charm City Cycling, Chris Nystrom. This event has grown tremendously in a relatively short time period. Give us a little history of the event. 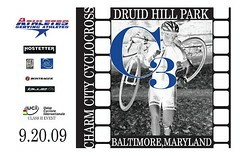 CHRIS NYSTROM: The inaugural Charm City Cross was in 2005. The event grew out of the Wednesday ‘Cross practices that Kris Auer organized. These practices were open to anyone and we developed an enthusiastic crew that learned a lot and had a ton of fun. At the end of the 2004 season this group got together for dinner and a celebratory send off to those headed to Nationals. At dinner Kris hatched the idea of us, as a community, organizing a race. Immediately the group embraced the effort with tremendous enthusiasm. From there the race has grown and the C3 team was born, but it’s still about serving the community and growing the sport of cyclocross. Georgia Gould even got started with ‘cross at these practices and has worked registration at the race. You are now a UCI C2 event, what does that mean and what does it change? Photo by Demon Cats Photography. Elite women at last year's race. NYSTROM: Being a UCI sanctioned event means that Elite Men and Women can score UCI ranking points. UCI ranking determines start position in other UCI races and National Championships. It is also an important metric in making the World’s team and start money (at races in Europe). To get UCI sanctioning we have to meet certain requirements such as a minimum prize list but there is really no impact on the other categories (other than hopefully deeper fields and better spectating for the Elite races). We decided to apply for UCI status to support racers at the top level that have aspirations of racing at a higher level. ‘Cross in the USA has experienced tremendous growth at the amateur level. With increased support for the Pro/Elite racers we should be able to develop more ‘crossers that can win at the World Cup level. Other than ditching the staircase and adding the run-up in the field, the course has remained consistent over the years. Any big changes planned for this year? NYSTROM: As a UCI event we can only have one set of planks so we are working on a way to force a run on the back-side hill. Other than that, the course is essentially the same as last year. Weather is always a factor for ‘cross courses and we traditionally have very dry, warm conditions. As of now the forecast looks promising with some rain later in the week to soften up the turf and a beautiful day on Sunday. Given the nature of the ground and terrain I still expect a very fast track. The sand pit traverses two volleyball pits and features a 180-degree turn in the middle. Has anybody ever ridden the entire pit? NYSTROM: I’m usually too busy during the day to keep track but I would bet that someone has ridden the entire thing during a race. I would also guess that they were a lot slower than those running it. If somebody has never raced Charm City before, what is one insider tip you can give. NYSTROM: Use the port-a-john’s set up next to registration. They will be delivered fresh the morning of the race. I wouldn’t venture into the others around the Park. 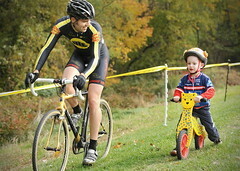 Chris Nystrom coaching up his Lil' Belgian for this year's race. NYSTROM: As a racer I like the tree planter natural obstacle. It’s at a strategic part of the course and there are always a bunch of spectators there making noise. As a spectator I like that entire area that includes the pit, tree planter, Lil’ Belgians course, and the sand. You can stay in one area and see most of the course. Plus, that’s where the Clipper City Beer Garden will be set up. What is your most memorable moment from this event? NYSTROM: Watching my son in the Lil’ Belgians race. What has been the most difficult part of being one of the race promoters? NYSTROM: Every year it’s the same. From February on we stress about all of the details hoping that everything comes together on race day. Luckily we have an incredible group that steps up to make things happen. Everyone takes great pride in putting on a race that people are stoked about. Do you plan on getting in any racing or will promoter duties have you tied down all day? NYSTROM: I plan on racing with the Elite Masters, promoter’s legs and all. We’ll be out there on Saturday prepping the grounds and back at 5:00am on Sunday setting up the course in the dark. That’s always an interesting experience, more like performance art than race set-up. Coming into the weekend, what about the race is keeping you up at night? NYSTROM: It’s really just an anxiety about everything running smoothly and everyone having a fun, memorable experience. If people have a good time at our race hopefully they’ll go home and sign up for a full season of ‘cross racing. Anything else we should know about race day? NYSTROM: We, as a cyclocross community, have a responsibility to keep ‘cross fun. By all means race hard, but remember to be supportive of other racers and respectful to the volunteers and officials. ‘Cross has experienced tremendous growth in the last few years. As our numbers grow let’s make a concerted effort to keep the ‘cross vibe alive. Kudos to Chris and Kris and their army of volunteers for a huge event turnout and successful race this year! Here’s hoping they and their event are around for a long time.